Dr. Jürgen Zeschky, Chief Executive Officer of Nordex SE, has informed the Supervisory Board of the company that he intends to leave the company for personal reasons. Dr. Jürgen Zeschky and the Supervisory Board of the company have agreed today that Dr. Zeschky will resign from his position as a member of the Management Board, effective 31 May 2015. Together with his fellow Management Board members, Lars Bondo Krogsgaard and Bernard Schäferbarthold, he has shaped and driven the company’s strong performance over the last years. During this period, Nordex has achieved strong sales and order growth as well as a substantial increase in profit. Dr. Wolfgang Ziebart, Chairman of the Supervisory Board, regrets Dr. Zeschky’s decision, thanks him for his great dedication and extraordinary commitment and wishes him all the best both personally and professionally for the future. During the period of strong growth over the last years, the company has made steady strategic enhancements to its organisational and management structures. The purpose was to establish an effective and flexible set-up, which reflects the positive business performance of Nordex. For this reason, the company’s organisational structures will be realigned from 1 June 2015. The future activities of Nordex will be led by Lars Bondo Krogsgaard, hitherto Chief Customer Officer, as Chief Executive Officer and Bernard Schäferbarthold, who will continue his role as Chief Financial Officer in the Management Board. 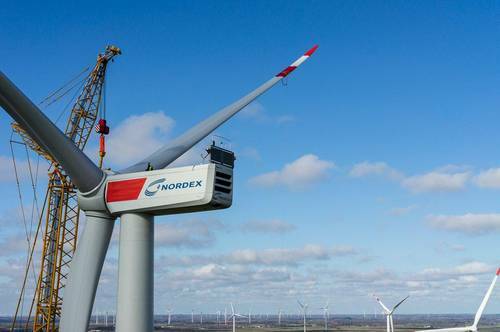 Both Krogsgaard and Schäferbarthold have been instrumental in Nordex’s business success in recent years and have a long track record in the wind power industry. Nordex is thus committed to management continuity. At the same time, an Executive Committee will be established, which will be comprised of the two Management Board members as well as executives from various core corporate functions. Chaired by Lars Bondo Krogsgaard, the Executive Committee will be responsible for strategic matters as well as specific project and operational tasks of overriding importance. The new structure includes many elements which have proven their practical value for Nordex over the last years, thus laying the foundations for continued business growth.